I love makeup. I realize I am stereotyping myself instantly but there is something relaxing and fun about buying new makeup for me that I cannot fully explain. When I walk into a Sephora or Ulta store I am immediately transported into a better mood than before. Now that I have bored all the non-makeup people reading this, I’ll explain how makeup is adding its own flair into the changing world of media. Sephora is known worldwide as being one of the top makeup retailers and in addition to carrying a wide variety of makeup, perfumes and skincare products, Sephora also developed “Science of Sephora.” This program ensures that the Sephora team is skilled to identify skin types, have knowledge of skin physiology, the history of makeup, application techniques, the science of creating fragrances, and most importantly, how to interact with Sephora’s diverse clientele. 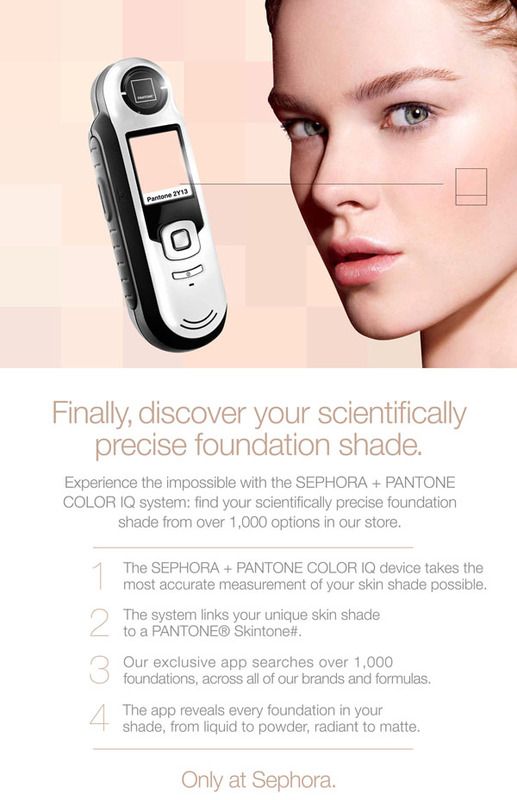 Sephora recently developed the Color IQ system to match customers to their perfect foundation shade. The system works by having a trained associate hold an iPhone-sized gadget up to your cheek, under-eye area and forehead while it takes snapshots of your skintone. About a minute later, it’s matched you with all the possible options in the store; after explaining what you’re looking for, the associate helps you test out a few of them, then emails you the rest with your Color IQ Number for future reference. Soon, this technology will be applied to more than just foundation as the plan is to expand this technology’s capabilities for other uses in the color world, like lipstick and blush shades. You can also try their handy online tool version on their website to test out a sample of the technology. Although I haven’t yet tried out this technology, I am planning on doing so during m next Sephora trip, all in the name of testing out emerging trends, right? Let me know if you’ve tried out this system! That was very interesting! I actually used this technology as a part of a class discussion previously. My brain cannot fully grasp how such a thing would even work, but I still am in awe. Thanks for sharing!